Hey hey hey! 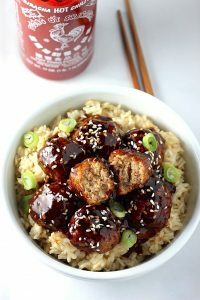 I have a spicy little surprise for you today: Healthy 30 Minute Sriracha Teriyaki Meatball Bowls. This recipe is fast, fiercely flavorful, and fun to make! It’s win-win din-din all around. This meal in particular is quite wonderful for a whole slew of reasons… below I have listed the top 5! 1) As mentioned earlier, it’s a 30 minute meal situation! If you’re anything like me, that alone is a major selling point. 2) FLAVOR. Holy cow. This meal has got so much going on in the flavor department. Sriracha and Soy and Ginger! It’s an explosion of awesome. 3) Makes a ton —> HELLO, leftovers. I love you. 4) It’s pretty darn healthy. I mean, only you can determine what’s considered good for you… but this recipe uses ground turkey meat, brown rice, and a homemade teriyaki sauce that’s packed with yummy body friendly ingredients like raw honey, ginger, and garlic. 5) Totally adaptable! I am a minimalist come dinnertime, so I was very bare in my bowl making process. Rice + meatballs + scallions = perfection. But! You could add a slew of different veggies to these bowls and really amp them up. I think crunchy carrots and cabbage could be delicious. So let’s talk about the homemade teriyaki sauce for a sec! It’s sooooooo easy, so don’t be scared off if this is your first rodeo with homemade sauces. I really love making this at home (opposed to buying it pre-made) because I can control what goes into the sauce. I’m always pretty disturbed when I pick up a bottle of teriyaki sauce and see it’s loaded with sugar, corn syrup, oils, and other nasty ingredients. I’ll save my sugar for cupcakes, thank you very much. So this sauce is made with honey, soy sauce, sriracha, ginger, and sesame oil. There’s a little cornstarch whisked in at the very end, just to thicken it up. Be sure to measure accurately when this step comes up; too much cornstarch will leave your sauce a giant goopy mess. As far as the meatballs go, the process is pretty straightforward. You’ll mix all of the ingredients together; roll them out into tiny, bite-sized balls; flash fry them in a VERY hot pan, and pop them in the oven for 10-11 minutes. 1) The meatballs only need to fry for about 1 minute on each side. We’re just looking to get a little color on each side, not cook them. 2) Be sure you place the pan with oil in it on the burner before you start making the meatballs. This saves time and allows the oil to really heat up. Hot oil = crispy meatballs. If you’re worried about smoke, just crack a window or turn your fan on. Once the meatballs have cooked, all you do is toss them in the sauce, plop them over the rice, and serve! I should note that I use instant rice in this recipe, which helps keep it under 30 minutes. Trader Joe’s sells a variety of microwaveable rice packages that I’ve come to love (not getting paid to say that!) and they’re ready in like 3 minutes. So be sure you either prepare your rice in advance or use instant rice to keep this meal a 30 minute situation. Heat 3 tablespoons of oil in a large skillet over medium heat. Allow the oil to simmer (you want it very hot) while you prepare the meatballs. In a large bowl combine ground turkey meat, garlic, egg, cilantro, sriracha, soy, ginger, scallion, pepper, and panko. Slowly add the water, a few tablespoons at a time. The mixture should be very moist but still hold its shape when rolled into meatballs. Scoop one heaping tablespoon sized round of meat into your palm and roll it into a small ball; repeat until all meat has been rolled into meatballs. Fry meatballs in batches in the hot oil, 1-2 minutes on each side; or just until lightly browned. 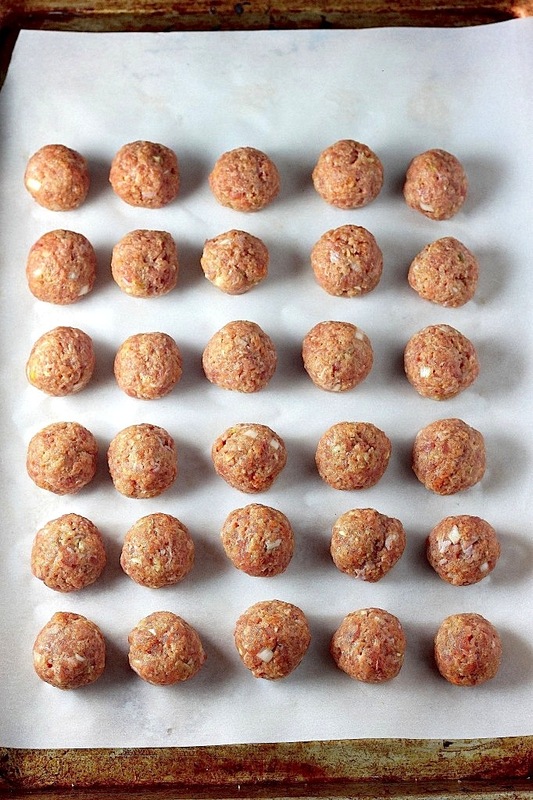 Place semi-cooked meatballs on prepared baking sheet. Once all meatballs have been panfried, place the baking sheet in the oven to bake for 10-12 minutes, or until they're cooked though. 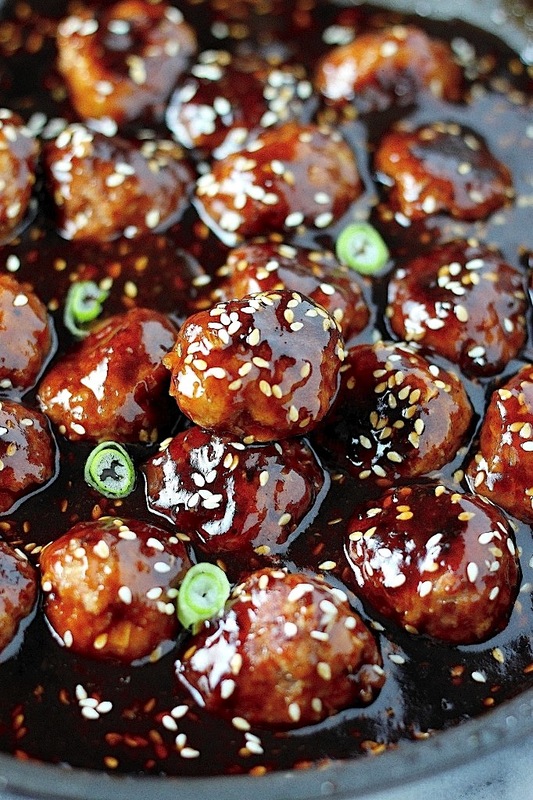 While the meatballs bake, make your sriracha teriyaki! In a small saucepan combine the soy sauce, honey, 1/2 cup of the water, sesame oil, sriracha sauce, and ginger. Heat over a medium-low flame and stir constantly until the honey is dissolved; about 3 minutes..
Increase the heat to medium high. Cook the sauce, stirring constantly, just until thickened. This should only take 2 minutes. Once it's thickened remove from heat and stir in sesame seeds. At this point the meatballs should be ready to come out of the oven! Transfer them from the baking sheet straight into the pot with the sauce; stir to coat. Place 1/2 cup of rice in each bowl. Top with a few meatballs, a sprinkle of sesame seeds, and some chopped scallions! Enjoy! There is so much flavor packed into this quick meal! Yum! Those meatballs look so crispy and wonderful! Definitely worth frying! very delicious! nice level of spiciness. only a couple complaints: I used way less than 1/2 cup water in the actual meatballs and what i did use seemed excessive. when i make these again I will use just a little water, prob less than 1 tbsp. Also, this took me closer to 1hr to make than 30 minutes, and I’m fairly comfortable in the kitchen. overall the flavor was great, will make these again. I have made this several times, and it always takes me at least an hour (for a single batch). I know my way around the kitchen too. Well worth the time. I also made a triple batch a day ahead for a party. I made extra sauce. On the day of the party, i threw them in the large crock pot on high with the sauce about 2.5 hrs before the party. Perfect make ahead party item, and everyone loved them!! This is exactly the comment I was looking for. I’m making these for a pot luck and LOVED this recipe when I tried it a few weeks ago. These are my new favorite recipe to rotate into my usual stuff. I made these with rice noodles to give it an Asian twist to spaghetti and meatballs and topped them with a bunch of green onions! Just made these tonight. I did make a few changes. I used ground chuck instead of turkey, I had no sesame seeds or oil so I omitted those, and cut the water for the meatballs from 1/2 cup to 1/4 cup. I baked the meatballs at 400F for 20 minutes instead of pan frying first. Regardless, they turned out great, the meatballs were moist and held their shape well. The ginger and cilantro really added a fresh taste to the meatballs. I will definitely make this again! Where are the nutritional values for this recipe as a whole? Are they written out somewhere? I’m trying to log into a weight loss app. Thank you! Hi Ashley. The recipe is at the very bottom of the post, right above the last photo. How many meatballs/servings does this make?? Thanks! Thanks! Could I simply replace the turkey with ground beef if that is all I have handy?? ps: I’m not much of a chef so I’m sure this is a stupid question. Hey Josh. Not a stupid question at all 🙂 Ground beef will work just fine! I followed recipe exactly. . With 1 lb turkey I made 32 medium-sized meatballs. Just made this recipe. It was delicious. I’m happy with the way it turned out but I made a few tweeks. I limited the water to a little less than 1/4 cup. I also added fresh naps cabbage and shreaded carrots. Yum! This made a TON so I will have leftovers for my little family. That’s always a plus! I followed your lead with the vegetables. I did carrots, onions, cabbage, red peppers. I added the sauce to the vegetables because the recipe made plenty. I also added about 3/4 tsp orange juice concentrate. I liked the citrus with the teriyaki. My husband was hesistant but after he tasted it, he said I could made it again. Winner. any nutritional information on this awesome dish?! Hi Margaret. At this time I do not provide nutrition information on recipes but I may in the future 😉 I know there are many apps and online tools you could use to enter the ingredients if you’re interested in getting it now. Note: I did not use ginger, onions, or cilantro. I used Honeysuckle ground turkey 97/3 lean, Progresso plain bread crumbs, Gunters pure honey, and I am not including the rice in this. Did you eat it with rice?? I wonder how much I should put in each serving to keep it on the healthy side? Anyway, they turned out great, I hoped to get some leftovers for my bento for tomorrow… but we wiped our plates clean!!! Thanx so much for this recipe! This was hand down the BEST recipe I have made in ages! Thank you so much for Sharing! I never leave comments on recipes but this one deserved it! Now on the weekly rotation! Hi Janel. Thank you so much for your comment and honesty 🙂 I really appreciate you taking the time to let me know you made and enjoyed this recipe. I’m making these now, for the 4th time in as many weeks! They are SO good! For an even faster meal, I freeze a batch of meatballs after the fry, then I just have to bake and make sauce- and they are still just as yummy! These are fabulous. Will certainly cook again. These are amaaaaaazing! Thank you for sharing the recipe. I’m currently making these for the third time in as many weeks. My husband loves it as much as I do! This was our first experience with sriracha too. I’m making this is I don’t move the meatballs to the oven. I start at a the pan at a higher temp to crisp them and then I turn the heat down and let those little babies cook through. It’s much more convenient than transferring them to the oven. Just my preference. Hi Elizabeth. I LOVE how much you’re loving this recipe 🙂 And I’m so happy you and your husband have discovered sriracha! Isn’t it amazing?! I made this last night and it’s absolutely amazing! That sauce is to die for. I will be making that sauce all the time to put on everything. I was worried because the meatballs alone were very bland, but once you put the sauce on the dish comes together. I added a bit more sriracha and in the end it was lacking a little salt. It was a fantastic dish and I will be making this very often. I can no longer find my favorite turkey meatballs at the store anymore. I am excited to have come across these turkey meatballs and can’t wait to try them!! They look delicious! Hi Kate. Yay! I am so excited for you to give these a try 🙂 Please let us know how they turn out. So I accidentally bought a few pounds of ground turkey instead of ground beef, but thought I’d try to find a recipe to put it to use. Oh my word I am SO glad I found this one! It is A-MA-ZING! I will definitely be making this again. Thanks for sharing! Hi Michele. I’m so glad you decided to try this recipe! More importantly, I’m so glad you enjoyed it 😉 Thanks for reading my blog and making my recipes – it means a lot! Delicious! Picky family of four LOVED it! Thanks for sharing, our tummies are happy and on a 105 degree day, this took 15 minutes with my prepaid meatballs! A great recipe! Replacing the panko with gluten-free oats buzzed in the blender for a few seconds, and using gluten-free soy sauce or Braggs makes the recipe celiac-friendly. If I don’t have time to make the meatballs, think frozen turkey meatballs would work out? Approx how many meatballs do you think you made per batch so I can guesstimate with frozen ones. Can’t wait to try this! any ideas on how to turn this into a crockpot recipe?? Thanks! If the nutritional values listed anywhere? sorry if I missed it! The meatballs are delicious and I find if you add steamed broccoli it works well too, however I must say the sauce was disgusting… 1/2 of soy sauce is waaaay too much. It made me feel sick. Next time I’ll use a different recipe for the sauce. I just tried this and I must say it was amazing!!!! I live in Denmark so I had some trouble converting the stuff into what we’re used to using here, and I couldn’t find turkey meat so I used chicken and it was delicious. Perfectly spiced and very comforting too! And just for the record, I have never (and I find a lot of recipes online I wanna try) found a recipe, made it and been totally happy with the result, without wanting to tweak it or anything! Thank you so much for this! The ingredients call for 3 teaspoons of grated ginger and then an additional 2 teaspoons of fresh grated ginger. I just want to double check that the first ingredient is a spice whereas the second ingredient is the fresh root itself. Thank you! I can’t wait to try out this recipe! Very good recipe. I made this tonight. This recipe is VERY hard to follow. I would suggest retyping it and separating the sauce and the meatballs INCLUDING the portions and measurements. This recipe is so delicious!! Only thing I will probably change next time I make this — less water in the meatballs. I agree with everyone else who said the 1/2 cup was a little excessive. I’d probably go with about 1/4 cup of water next time. Still… a very easy and incredibly tasty meal!! Two thumbs up. Hi Angelica. So happy you enjoyed the meatballs 🙂 They’re one of my all-time favorite recipes. going to have this for my dinner. Do you have to use raw honey or can I use the regular honey? Have never bought raw honey not sure if I’d like it…..
Hi Patti. Regular honey should work just fine! Wouldn’t regular honey be a better fit for this recipe anyway since cooking the honey kills the beneficial enzymes of raw honey anyway? One more question… Can you use the ground ginger that comes in a little spice jar? Hi Patti. I would recommend using fresh grated ginger, as ground ginger has a much different taste. If you do decide to try using the ground ginger, I would cut the amount in half. This is so delicious! I’m definitely going to try more of your recipes! Made these recently – so good and easy to make. The leftovers were even better the following day 🙂 Will definitely put this in the regular weeknight meal rotation! I hate to be “this person” while it is absolutely delicious, this is anything but healthy. I just put this recipe into my calorie tracker and it’s 1,800 a serving!??! That’s insanity! I really like this dish because it was supposed to be a healthy option, it’s unfortunately anything but healthy. It’s def got a kick! I’m not a great cook by any means… But I know my way around a kitchen… Definitely took me 1hr with prep time (cutting, making balls, etc). Had bag of Ikea Veggie Balls in the freezer that needed to be used. Looking for recipes to use them I stumbled across this one. JOY!! Baked the veggie balls, made the sauce, and served as directed with finely sliced scallions and sesame sprinkled over the brown rice, veggie balls and glaze. Soooo good. Now you have a vegan version too! This is not “healthy” by any means!! This is a low fat, high protein recipe, but the amount of sugar and carbs per serving is out of this world! I didn’t even eat the rice with it because I was already getting 45 g of carbs; if I added the rice, I would be eating up near 100 g of carbs! Note: I did not use ginger, onions, or cilantro. I used Honeysuckle ground turkey 97/3 lean, low sodium soy sauce, Progresso plain bread crumbs, Gunters pure honey, and I am not including the rice in this. Everyone is entitled to their own idea of “healthy”. While I do find this recipe much healthier than Chinese take-out, I understand it is not for everyone. Your feedback is helpful and appreciated. How many meatballs does the recipe yield? Hi SW. It yields about 2 dozen meatballs. Great recipe! I tried it tonight for the first time and had great results. It took me about an hour, but maybe that’s because I made the rice at the very end when everything was done cooking. I also didn’t have any sesame oil or cornstarch so I omitted those items. Overall, easy and delicious! Hi Amber. So happy you made and enjoyed this recipe! Making the rice at the end could definitely add to the overall cook time. I love spicy Oriental..but the hubs said it was too spicy-hot..even with half the Sriracha and extra honey! His loss…but will try maybe 1/2 tbsp in the sauce..I also added a bag of frozen broccoli, carrot, water chestnut (cooked for 3 min in microwave ) Excellent! Lots of flavor but meatballs fell apart. Also did not take 30 minutes to make. No idea whats’ for dinner one night and found this awesome recipe. The neighbors dropped by when I was making these so I made a bigger batch. Wow!! They’re absolutely delicious. Everyone loved them (kids too) and there were no leftovers. This recipe is on our top 10 favs list now. Absolutely delicious recipe. Thank you so much for sharing it. It is definitely going to become a staple dish in my household! These are wonderful! Made them tonight–it’s a solid recipie that doesn’t suffer for a few emergency ingredient subs. My parents loved them and they paired really well with the Thai peanut salad I made for the side. I tried this last night, and it was the most delicious dish I have made in a very long time! I am not the biggest fan of turkey, but because I’m trying to eat better and lose weight, I tried this and I also don’t like to experiment and try new things. It was SO GOOD! My husband couldn’t stop telling me how good it was, and then I took it to work and let my co-workers try it. Needless to say I made a few copies of this recipe for them to go home and have their own helpings. THANK YOU so much for this recipe! I have a new dish and a way to make ground turkey taste amazing! Loved the flavor. Took over an hour however to prep and cook and I cook for a living. Too much water for meatballs but I did follow recipe and you stated add a tablespoon at a time until you reach right texture. Thanks for that! Otherwise besides making regular brown rice (not a huge fan of microwave versions) it was a great recipe! Hope people try even if it does take a lot longer to perp. Joe, if you do not wish to read the text, you can always scroll directly to the recipe. So bland we wouldn’t feed it to our dog. Clearly whoever made this recipe doesn’t know anything about spice to meat ratios. We give it a 4 out of 10. Will be sticking with hot pockets and poptarts next meal. Great recipe! Full of flavor, meatballs were moist (I was skeptical about the water, but used all but about a tablespoon). It did take me about an hour to prep and cook, but definitely worth it! Thank you for the recipe. Very tasty. It took 90 minutes to make. These are seriously a staple item for me; I often cook a 2lb batch of these on Monday night so the boyfriend and I have lunch the rest of the week. So good! I’m not sure why some people have to be such jerks with their comments. This recipe was fantastic. I think it’ll be my new go-to for turkey meatballs. Making this tonight – my turkey was a ‘tube’ and very finely ground, ended up having to almost double the panko to make it hold together. When trying to fry them up, it was a disaster, even though they held their shape, when they got warm they flattened out – still the flavor is awesome! And they baked up just fine we just enjoyed them flat, :). The teriyaki sauce balance was somehow off not sweet enough, or maybe not salty enough – really couldn’t figure it out – or maybe it was my ingredients, but put it all together and it turned out just fine, and we enjoyed the meal tremendously. I think next time I’ll add some cornstarch to the turkey mix itself and see if that doesn’t help with consistency and ‘stability’, I use it in my wonton mix for the same and it seems to work amazingly well. THANK YOU for a great recipe!! I stumbled across this recipe while searching for something different to cook for dinner. And man, I’m sure glad I did! The meatballs were great, but the sauce was fantastic! I was licking the plate. Thanks so much!!! This recipe is awesome! My husband loved it and the flavors in the sauce were amazing! I doubled the sauce recipe and used ground pork with hamburger. Sticky rice goes great with the sauce. Broccoli on the side! For a party – make the sauce regular way and pour the sauce in a crockpot and add the meatballs to keep warm! I was looking for something different to make for dinner and found this recipe. I made it last night and it was amazing! My husband literally gave me a high five and couldn’t stop saying how delicious it was. So glad we found something new to make that’s so delicious and so easy to make. Also, I love the technique of frying the meatballs before baking, going to try this next time I make meatball subs. Thanks for posting! These are absolutely delicious. I made them once and was so pleased, I tripled the recipe and made it for Superbowl Sunday. They did not last. One thing, I made them exactly as the recipe called for the first time and they were VERY delicate. I left off the water the second time and they were much easier to transport from frying pan to baking sheet. So happy they were a hit, Kate! Amazing!! This will be my go to! OMG! I made these last night for dinner and I have to say they are delicious!! I can’t believe anyone would say these were bland. I made the recipe exactly as written and they have just the right amount of spice. I can’t wait to make them as an appetizer for my next party! Thank you so much for publishing it. what do u think willl these trn out with gr. turkey breast? I’ve done it and yummmmm to the max! My husband loved this recipe – said it was too he best new recipe I’ve tried in ages. Will definitely make again! I LOVE this recipe. I have made it so many times. The biggest issue is that it is absolutely NOT a 30 minute meal. It takes me at least an hour to prepare every single time I have made it, even when getting all my ingredients ready before. This should not deter anyone from making it, they should just be prepared for a much longer prep time than what is advertised. It’s more of a weekend meal or a meal to make if you have nothing else to do after work. Hi Becky! Thank you for your thoughtful and honest comment! So happy you love this recipe, even though it takes some extra time in the kitchen. I realize this is an older post, but I just found it yesterday. I made it for dinner tonight. I did omit cilantro (we aren’t fans), I also threw coleslaw mix into the pan I fried meatballs in and cooked it to add. This was delicious! It is a bit of work. Nothing major. I think it took me about 45 mins to prepare. This will be made again for sure! Next time I will add the whole bag of coleslaw mix though. Thank you for sharing this!! I’ve made these several times now so I figured I should leave a comment. These meatballs are so so so good! Thank you for this amazing recipe!! This is so delicious! I have yo admit I did not read properly before starting and added all of the ginger to the meatballs but it still turned out so yummy that my 2 year old is eating it so that’s a win/win! Thanks for the wonderful recipe!! !